Wherever a bolt or nut comes in contact with the rubber we use a stainless steel washer. The bolt on the outside edge that fastens the chain on the under side of the tire is indented into the tire to prevent the bolt head from prematurely wearing off. The frame that the back drag fastens to is made of 3 inch x 4 inch x ¼ inch tube steel for strength. A unique safety feature is that a step grip is welded on the frame where the operator's foot first comes in contact. 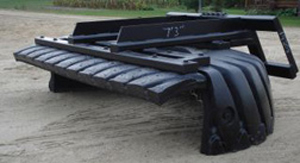 This ensures that when the operator enters and exits the skid steer s/he does not slip. A frame should last 2-4 tires. Our tire is easily replaced for 1/3 the price of a new complete unit by simply cutting off the old bolts, laying the frame on top of the new tire, drilling new holes and fastening the tire to the frame.